India Art Fair 2017 demonstrated emphatically that confidence in the contemporary art market is high, with over 90% of galleries reporting strong sales results (94% of Indian galleries and 85% of international galleries sold). The prices of the works at India Art Fair ranged from more affordable pieces in the region of $1,000 to major works by artists such as S.H. Raza, F.N. Souza, and M.F. Husain, priced upwards of $8 million. Almost 60% of the 72 exhibiting booths made sales to new and international collectors and over 30% were made to collectors under 40. International interest in India Art Fair has never been higher, with strong attendance from directors, curators, patrons and delegations from prestigious museums including The Met, MOMA and the Guggenheim in New York, TATE, the Ashmolean Museum in UK, Palais de Tokyo in Paris, The Singapore Art Museum, M+ in Hong Kong - to name a few, all looking to find new inspiration in a less exposed region. With a growing base of new collectors from across the subcontinent, India Art Fair’s position as a critical point of cultural exchange and a portal into South Asian art continues to be affirmed by its successful Collectors’ Programme. Conversely, it is increasingly evident that global Indians are broadening their horizons to the international market, with evidence of deeper engagement with the select international galleries present at the fair. Further to this, the 2017 edition has seen the largest number of collectors from Mumbai since the fair’s inception. Building on India Art Fair’s ongoing ambition to promote cultural discourse within the region, the Speakers’ Forum was received with critical engagement and debate reinforcing this platform at the fair as a vital forum for discussion within the region and globally. Notable speakers, sharing an array of engaging themes, included Richard Armstrong (Director, Solomon R. Guggenheim Museums and Foundation) and Sheena Wagstaff (Leonard A. Lauder Chairman of Modern and Contemporary Art, The Metropolitan Museum of Art) Boon-Hui Tan (Director, Asia Society Museum), Sheikha Hoor Al Qasimi (President and Director of the Sharjah Art Foundation), and Anurag Khanna (collector), Vir Kotak (Joint Managing Director, JM Baxi Group), Ashiesh Shah (Founder, Principal Ashiesh Shah Architects). The Art Fair proactively engaged a range of demographics with a strong policy of diversity and inclusion bringing together children from over 32 public schools in Delhi along with underprivileged children and those with special needs through a series of specially curated participatory events and tours. One popular return to India Art Fair was Platform, providing an opportunity for the best of established and emerging South Asian galleries, artists and artist collectives to exhibit on an established international platform. Dina Bangdel, Curator of Nepal Art Council said "Having India Art Fair's Platform series has been absolutely critical for exposure. For the South Asian artists themselves it is an amazing opportunity. Last year's artists have now gone on to exhibit at numerous biennales and triennales and I think that is really due to India Art Fair and our collaboration with them." The recognition of India Art Fair’s place and significance, as both aggregator and facilitator, driving the Indian and South Asian art market in a global context, was re-affirmed early in 2016 when MCH Group, the owners of the Art Basel fairs, announced their partnership with India Art Fair, in their first commitment to their new Regional Art Fair initiative. The initiative is designed to bring a portfolio of the world’s leading regional fairs together to mutually benefit from shared knowledge, contacts and regional expertise in order to help each fair realise it’s maximum potential in a global context. In 2018 India Art Fair will mark its 10th anniversary. With MCH Group’s involvement, the fair will progress as a leading face-to-face, and digital platform, supporting galleries and partners with a broader reach throughout the year. Rajeeb Samdani, Founder of the Samdani Art Foundation and Dhaka Art Summit said: "There are a lot of non-commercial events in the region, including the Dhaka Art Summit, the Kochi Biennale and Colombo Biennale, but what is vital for the growth and survival of the art scene in the region is a fair, a market place and a collector base. Since it began, India Art Fair became a meeting point for everyone, which is of huge importance. 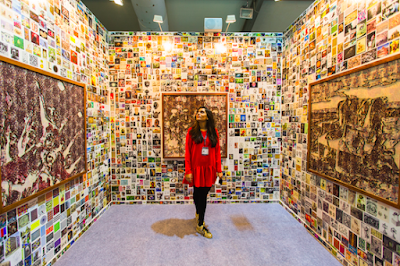 For the next generation of collectors, India Art Fair is the best place to come." Frédéric de Goldschmidt, Collector, Brussels said: "India Art Fair and the Delhi art community seems to be working very well together. As a collector it has been wonderful to be so well received by all the different collectors, museums and galleries, who have had an opportunity to put on their best shows, not only for the international visitors, but also for the Indian visitors and local people. The fair seems to be developing on a rich soil of private initiatives, fuelling a hunger and desire for cultural and artistic activities." Suhel Seth, Managing Partner of Counselage India said: "I think India Art Fair is evolving with grace, elegance and maturity. It's now not just a platform to showcase great art - there is a strategic thematic strain running right through the fair. What is very impressive is all the adjunct activity going on, whether it's the Platform exhibits, the confluence of technology and art, or the manner in which people are being encouraged to participate. … What I love is that the theme has been tightened to South Asia, because then you create a point of discrimination compared to the 250-odd art fairs that happen all over the world." Alessio Antoniolli, Director, Gasworks said: "I think what's interesting about the art fair this year is that there is a focus on South Asia so it's a great opportunity for someone from abroad to come here and to use it as an opportunity to research what's happening on the ground. Not only in the market but also younger artists who may be introduced through the various galleries here." Boon-Hui Tan, Director, Asia Society Museum said: "I think the fair has really grown from its first iteration many years ago. I came when it was the Indian Art Summit. What is most interesting is the scene that has grown around it, how alongside the fair, there are all these other gallery and museum exhibitions. I think this makes it the prime convening platform. This is where the entire art world in South Asia gathers."